1. How long is it safe to keep cheese? 2. How should you refrigerate cheese? 3. What is the best way to melt cheese? 4. If cheese gets moldy, should I throw it away? 5. What is the best way to microwave cheese? 6. I am having a party this weekend and wonder what temperature my cheese tray should be served? 7. My cheese always breaks when I shred it. What is the best way to shred cheese to keep this from happening? 8. We disagree about the best way to store cheese. I say in a plastic bag, but my friend says you should store cheese in foil. Who is right? 9. I am interested in purchasing cheese on-line. Can I do that on this site? 10. Can you make cheese last longer by freezing it? 11. How can I obtain educational materials (i.e., pamphlets, videos, etc.) on cheese? 12. Which cheeses have the least amount of fat? And which have the most amount of fat? 13. I love cheese, but can it fit into a healthy diet? 14. I love cheese, but I'm lactose intolerant. Can I still incorporate cheese into my diet? 15. Why does Swiss cheese have holes? Soft cheeses should be eaten soon after purchasing. As a general rule, the harder the cheese, the longer it will remain fresh. But remember, cheese will continue to ripen, no matter how carefully it is stored. Hard cheeses will generally keep for several months, whereas softer cheeses will keep from one to three weeks after opening, if stored in an air-tight container. In addition, large pieces of cheese tend to keep longer than shredded cheese. Cheese should be refrigerated at temperatures of 35° F to 40° F in the original wrapping or container, or in waxed paper, transparent wrap, foil, plastic bags or tightly covered containers. Cheese cut into small pieces or shredded promotes a more even melting in a shorter amount of time. When you add cheese to any recipe, cook on low heat, stirring constantly. High heat will toughen cheese and make it stringy. When you are making a sauce with cheese in it, add cheese as the last ingredient and heat until just melted. Mold may develop on the surface of cheese. Although most molds are harmless, to be safe, cut away 1/2 inch of cheese on all sides of the visible mold. Use remaining cheese as quickly as possible. 5. I keep trying to microwave cheese on my nachos, but it gets hard. What is the best way to microwave cheese? Remove the cheese wrapper and place on a microwave-safe plate. Microwave at 30 percent until cheese reaches desired softness and/or temperature. Check every 10 seconds to prevent overheating. Cooking times will vary among microwave ovens. The flavor of cheese is best when eaten at room temperature, so remove from refrigerator 1 to 2 hours in advance of serving time. Soft cheeses take a shorter amount of time to come to room temperature than firm and hard cheeses. Cheese will shred more easily if well chilled; it can also be placed in the freezer for 30 minutes before shredding. Actually, you both are. All cheese should be stored at temperatures between 35° F and 40° F in tightly wrapped foil or plastic to protect it from drying out. Strong smelling cheeses like Limburger should be keep in a separate container to prevent odors from transferring to other foods. Because this is a non-branded cheese Web site, we do not actually sell cheese from this site. However, there are several sites on the Internet that do sell cheese. We recommend you use a browser and explore using cheese. This will lead you to a wealth of resources. Most hard cheeses can be frozen, however, there will be changes in texture. 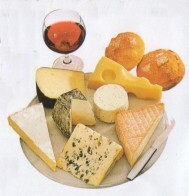 If you are looking for information on a specific cheese, check out Cheese Profiles in the All About Cheese section. Generally speaking, thawed cheese is best used crumbled or shredded, in salads or as toppings, or in uncooked dishes. For educational materials, please contact the National Dairy Council at 1-800-426-8271 and request a Nutrition Education Materials catalog. Each variety of cheese has a nutrition story as unique as its flavor, so we suggest you refer to product labels for information about individual products. All foods in moderation can fit into a healthy diet and lifestyle. One of the key principles is eating a balanced diet with a wide variety of foods. And the best diet incorporates the foods we love the most, like cheese. Most of the lactose found in cheese is removed with the whey during the manufacturing process. As a result, most ripened cheeses, such as Cheddar and Swiss, contain about 95% less lactose than whole milk. Additionally, aged cheeses contain almost no lactose and processed cheeses contain only a slight amount more. When shopping for cheese, look at the nutrition-facts panel on the labels. If the amount of sugars listed is 0 grams, it does not contain lactose. The most recognizable characteristic of Swiss cheese is its holes, which punctuate the pale yellow exterior. These holes, also called "eyes," are caused by the expansion of gas within the cheese curd during the ripening period.